Stocks were unable to maintain the momentum and gave up ground in another roller coaster week. Though earnings week marched onward, investors seemed more concerned about global growth and falling commodity prices. 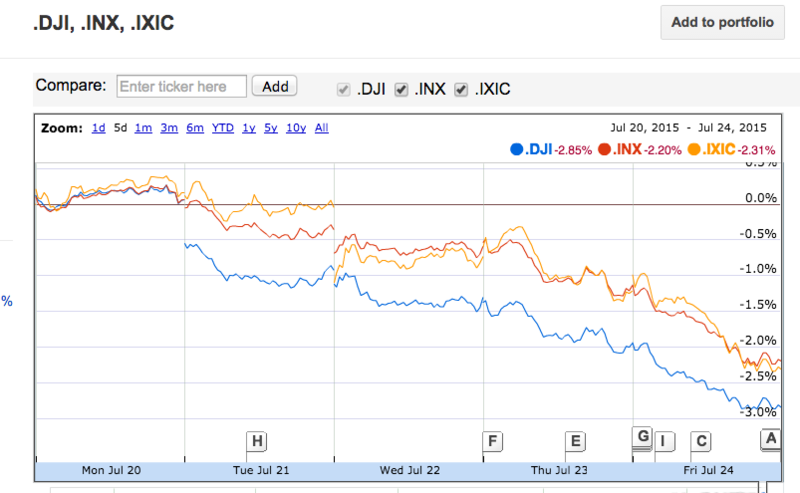 For the week, the S&P 500 fell 2.20%, the Dow dropped 2.85%, and the NASDAQ lost 2.31%. Falling commodity prices contributed to a lot of last week's selloff as investors worried that plummeting gold, copper, and silver prices meant slowing global economic demand. Commodity prices were hit hard by new data out of China that shows manufacturing activity is at a 15-month low. The Asian giant is the world's largest consumer of industrial metals, and commodity traders worry that falling demand could lead to a glut in metal supplies. Are fears about China overblown? Possibly. Between the recent stock selloff in China and fresh concerns about a hard landing for the Chinese economy, it might seem that the global bull market might be ending. However, let's take a step back and take a look at the big picture. While the Chinese economy is the second largest in the world and could certainly disrupt global growth, the size (and structure) of its stock market means that volatility there isn't likely to affect U.S. equities. In fact, Chinese stocks had already experienced two bear markets since 2009 - neither of which seriously affected our domestic bull market. China's central bank is also taking an active role in boosting economic growth. All that being said, the past can't predict the future, and we're keeping a close eye on what's happening overseas. While we do see some headwinds and potential threats on the horizon, we still believe in a globally diversified portfolio strategy. On the domestic front, earnings season continued last week and the picture thus far is uninspiring. As of July 22nd, we have gotten results from 103 S&P 500 members and total earnings are up just 3.0% on 1.2% higher revenues than the same period last year. Fortunately, not everything is bleak. Multiple sectors have seen success stories, and overall earnings are being dragged down by the beleaguered Energy sector. Are these results unexpected? Not at all. Much of the weakness was anticipated, and analysts are hopeful that growth will pick up in 2016. However, the tepid earnings picture leaves many investors wondering if the Federal Reserve will see enough growth this year to raise rates. Attention will turn to the Fed's Open Market Committee when it meets next week, and though we don't expect any decisions about interest rates to be made, we hope that the Fed will give us some insight into what they think about recent global growth worries. Earnings season will continue, and we'll also get another look at second quarter economic growth, which is expected to rise slightly. New home sales drop in June. Sales of newly built homes unexpectedly fell last month to the lowest level in seven months. Since data last week showed that new permits are up, analysts hope the setback is temporary. Existing home sales skyrocket in June. Resales soared last month on pent-up demand to their highest level in nearly 8-1/2 years. Analysts hope that the housing market will keep its momentum ahead of possible interest rate increases. Jobless claims drop to lowest level since 1973. The number of Americans filing new claims for jobless benefits plummeted last week to a multi-decade low, suggesting that hiring remains solid despite summer volatility. Greek cash limits unlikely to go away soon. Greek banks will likely maintain cash withdrawal limits (currently about $460 per week) until fresh money arrives from Europe, worsening the crisis for Greeks. Questions about how to restructure banks may hold up bailout negotiations.